One thing I’m doing differently this year is to count mites post treatment. I lost more hives last spring than is “normal” for me and I’m convinced that mite loads were the larger contributor to this loss. I normal treat all my hives at one time thinking that bees with mites drift between hives and weaker hive are robbed out moving mites along with the honey. There are people that don’t support this thought so I just following my plan. I had one hive that I did not treat in early July as it had honey supers on it that I planned to extract. Treatment with honey supers is against labeling instructions and I try to follow the requirements. I sampled this one hive several days ago using alcohol wash. I counted the bees from the alcohol wash and went over the 300 by a good bit. Hard to get bee cooperation with this technique. My count is 427 bees and I did not see the queen, lucky me. I filtered the alcohol through a funnel with a cotton pad as the filter and counted 36 mites. So if my bee count and mite count is anywhere close, the hive has 11.8 mites per 100 bees. From all data I can find this is a very high mite count bordering on the hive will not survive. With this in mind, I added mite away quick strips between the top super and the middle super. I will be performing a 2nd mite count after the 7 day treatment period to see if there has been a drop in mite per bee numbers. 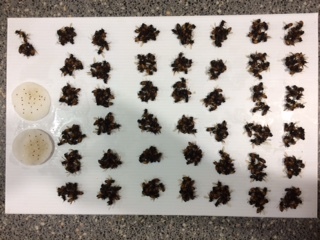 Although the weather has been not the best for the routine hive work such as mid summer nucs and re-queening, it is good for formic acid treatment as the daily temperature for several days is in within the formic treatment range. If the mite count is still high after this, I’ll work on a different strategy. Here is a photo of the counting. Each group of bees is 10. I really enjoyed your article, “A Training Yard….” in the August 2018 issue of the American Bee Journal. I wish I would have had access to a training yard when I was a new beekeeper rather than using the old trial and error method. Kepp it up and please keep publishing in ABJ! I have one question though. In the article, you mention “a commercially available three-section, medium frame queen castle.” Could you please provide me with your source or sources for this queen castle? It sounds really workable. I’m glad you enjoyed the article. I use only medium frame supers so my queen castles are medium. You can also get deep frame queen castle. The medium frame unit holds 3 frame per section and the deep holds 2 frame per section.